My name is Sally Perigo and I live in Cookham in Berkshire. A passionate gardener for many years, I trained as a horticulturist and garden designer in 2001. I lived and worked in the South of France for over 12 years and am particularly interested in low water requirement and drought tolerant gardens, which not only save on water, but saves you money and time spent watering. 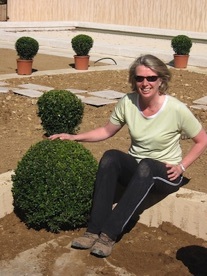 Before and during my training to be a garden designer I worked in the customer service industry and have a wealth of experience of working with people and I am very customer focussed. I bring these skills into my garden design practice and ensuring my clients are happy is my number one priority. I was delighted to be the winner of Jackson’s Fencing garden designer competition in 2014 and have a show garden at their headquarters in Kent. You can see my profile on their website here and photos of my winning garden here. I work in the South East of England. If you like my work and would like to talk to me about your garden, please feel free to contact me, by phone or email.